Don't forget today is Towel Day! It is the Tip of the hat to Douglas Adams Day! I must get thru the rest of the The Hitchhiker's Guide to the Galaxy over the summer. 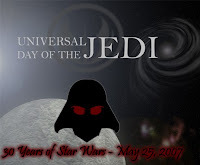 Today is also the first Universal Day of the Jedi. Some online suggestions have including dressing as a Jedi to work and attacking colleagues with Force FX Lightsabers; or stating "May the Force be with you" to everyone one passes by. Last week I posted a little test about Google's Adsense Program Policy about encouraging clicks. It mustn't of violated any policies because I haven't heard anything from Google (yet). The real test was to see if talking about your ad's or encouraging click would result in any actual clicks. With about 300 page views I got 0 clicks in the last 7 days. Maybe my ads are placed in the wrong area of the site or blend in too well! I was just curious anyway... Now I know! 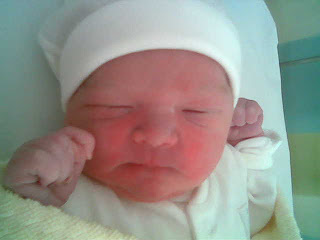 A hello and welcome to the world to my new cousin Cormac David Harrington. Cormac, you'll be looking at this when your all grown up after Googling your name. The time stamp is a day before your Birthday because I'm in Canada! I can see into the future! Bebo also asks the same question, and Facebook wants your status. Google also has a Daily Me Gadget you can easily make for your iGoogle page. However the only one I update is Twitter. Bebo is stuck on "twitter.com/darran" and Facebook gets that same status every week or so! Why isn't there a service/website that you can sign up to that will update everything all at once. Everyone then can just see your status on which ever service they prefer! P.S. My little test going well... update this Sunday. P.P.S. I'm thinking of picking the "Closed sign"as my Flickr Photo for the 5th of May. I'm sure this is all over the news and everyone knows about it at home. I heard about this a couple of weeks ago, there have been a few "Vote for Mister Tayto" election posters up. I just found their party political broadcast! May not place misleading labels above Google ad units - for instance, ads may be labeled "Sponsored Links" but not "Favorite Sites"
Does talking about your ad's violate the policy? With a shift change at work, my plan for getting up the mountain in the afternoon was interrupted. Instead I managed to take a load of pictures around the village and at work! Take a look here and leave a comment on which one I should submit to the group! I am a Generous Leader, apparently! Not your typical way of answering questions. Be warned, at 11 pages, it is a long survey/quiz! 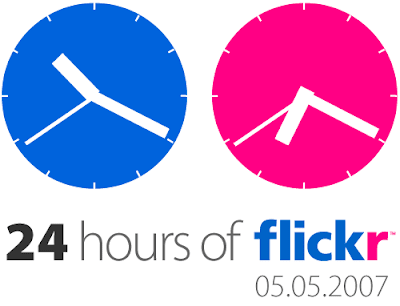 This Saturday is 24 Hours of Flickr. What happens around the world in one day? Life. To celebrate this global community, we invite you to join us in "24 Hours of Flickr" – a day-long global photo project. On May 5, 2007, grab your camera and whatever else you need, and chronicle your day in pictures. The group's photos will be featured at Flickr events around the world this summer and in a companion book, which will contain a selection of photographs chosen from the group (more about this soon!). So get your camera, charge the battery's, clear the memory and get snapping on Saturday. Then Join the 24 Hours of Flickr group and upload! UPDATE: If you have a photo that is selected to get in the book, they will send you a free copy!